What does the banjo music of the fabled criminal sound like? This project was posted shortly after noon, California time, on Thursday, November 17, 2016, with a deadline of 11:59pm wherever you are on Monday, November 21, 2016. Step 1: Ghost stories are prevalent throughout cultures. When they involve music, they manifest in ways that find parallels between two intangibles: ethereal presences, and a cultural form that you can, generally speaking, neither see nor touch. 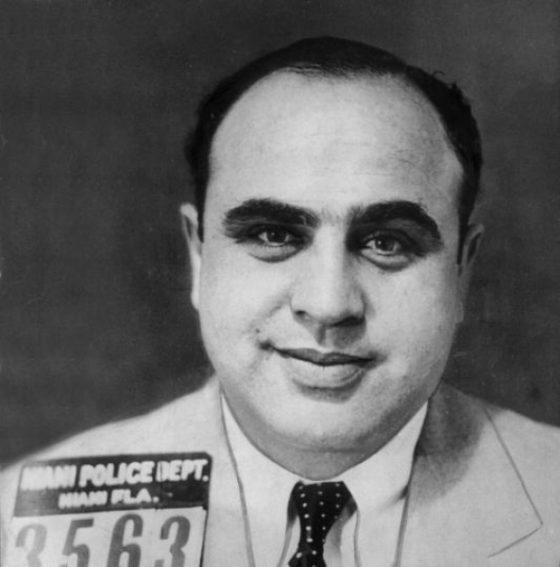 Now consider the case of Al Capone, who played banjo during his time on the famed prison island of Alcatraz in the San Francisco Bay — a banjo that is said to be heard long after his death. Step 2: Create a short piece of what you think Capone’s ghostly banjo sounds like. Step 1: Per the instructions below, be sure to include the project tag “disquiet0255”(no spaces) in the name of your track. If you’re posting on SoundCloud in particular, this is essential to my locating the tracks and creating a playlist of them. Deadline: This project was posted shortly after noon, California time, on Thursday, November 17, 2016, with a deadline of 11:59pm wherever you are on Monday, November 21, 2016. Length: The length is up to you, but two minutes sounds about right. Title/Tag: When posting your track, please include “disquiet0255”in the title of the track, and where applicable (on SoundCloud, for example) as a tag. Public-domain mugshot associated with this project from Wikipedia.